The group appears solemn and contemplative of what they are about to undertake as they pray for divine protection through their voyage; the words "God with us" appear on the sail in the upper left corner. The figures at the center of the composition are William Brewster, holding the Bible; Governor Carver, kneeling with head bowed and hat in hand; and pastor John Robinson, with extended arms, looking Heavenward. Gathered around them are the men, women, and children going on the voyage. Some are dressed in traditional puritan attire while others wear more fanciful and bright garments. The armor, helmet, and musket in the foreground represent the tools that the Pilgrims will use for protection in the new and unfamiliar land. In the background on the right are the city and people the Pilgrims leave, and on the left a rainbow represents the hope and promise of what lies ahead. Weir's depiction of the event was drawn from Nathaniel Morton's New-England's Memorial of 1669 and, Cotton Mather's Magnalia Christi Americana. 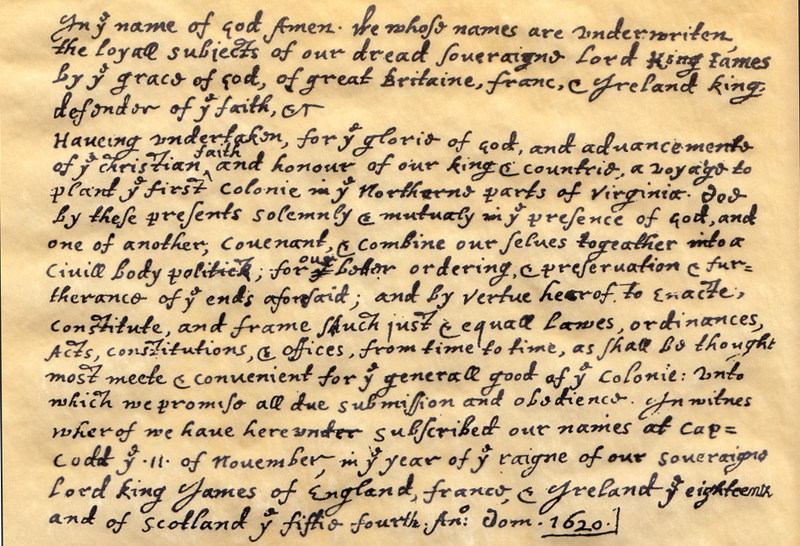 Now four centuries, On November 11, 1620, the adult male passengers signed the Mayflower Compact. us. The Mayflower Compact was the first governing document of Plymouth Colony. It was written by passengers of the Mayflower, consisting of separatist Puritans, adventurers, and tradesmen. The Puritans were fleeing from religious persecution by King James of England. A national Thanksgiving Proclamation issued by George Washington, President of the United States, on October 3, 1789. This was the very first federal Thanksgiving Proclamation issued. discreetly and faithfully executed and obeyed; to protect and guide all sovereigns and nations (especially such as have shown kindness to us), and to bless them with good governments, peace, and concord; to promote the knowledge and practice of true religion and virtue, and the increase of science among them and us; and, generally, to grant unto all mankind such a degree of temporal prosperity as He alone knows to be best. Gazette and Country Journal, on October 17, 1789. Issued by George Washington in 1795.